In 1979, Wisconsin native Tim McBride hopped into his Mustang and headed south. He was twenty-one, and his best friend had offered him a job working as a crab fisherman in Chokoloskee Island, a town of fewer than 500 people on Florida's Gulf Coast. Easy of disposition and eager to experience life at its richest, McBride jumped in with both feet. But this wasn't a typical fishing outfit. McBride had been unwittingly recruited into a band of smugglers--middlemen between a Colombian marijuana cartel and their distributors in Miami. His elaborate team comprised fishermen, drivers, stock houses, security--seemingly all of Chokoloskee Island was in on the operation. As McBride came to accept his new role, tons upon tons of marijuana would pass through his hands. Then the federal government intervened in 1984, leaving the crew without a boss and most of its key players. McBride, now a veteran smuggler, was somehow spared. So when the Colombians came looking for a new middle-man, they turned to him. McBride became the boss of an operation that was ultimately responsible for smuggling 30 million pounds of marijuana. A self-proclaimed "Saltwater Cowboy," he would evade the Coast Guard for years, facing volatile Colombian drug lords and risking betrayal by romantic partners until his luck finally ran out. 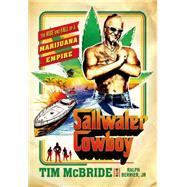 A tale of crime and excess, Saltwater Cowboy is the gripping memoir of one of the biggest pot smugglers in American history. Tim McBride went from small-town pothead to big-time pot hauler, before being sentenced to ten years in prison for presiding over a drug-smuggling empire. Today he owns a construction business and is a father of two. He lives on the Gulf Coast of Florida. Ralph Berrier, Jr. is a veteran journalist and the author of If Trouble Don’t Kill Me: A Family’s Story of Brotherhood, War, and Bluegrass.